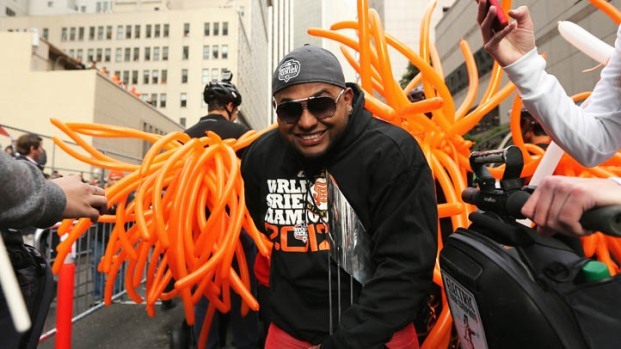 Giants fans ditched their cars and took public transportation to Wednesday's ticker tape parade. 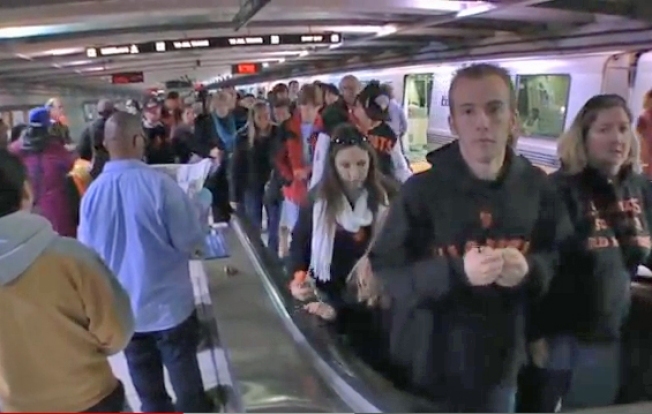 BART was the most popular way to get to San Francisco for the Giants victory parade. San Francisco Giant fans, Halloween revelers and regular working folks pushed BART passed its all time ridership record on Wednesday. BART reported moving 568,061 people back and forth across the Bay Area and that is 45,863 more riders than its previous record. The previous high was on November 3, 2010, which just happened to be the last time the City hosted a World Series ticker tape parade down Market Street. The numbers were 40-percent higher than a normal October week day, according to BART. "This was a tremendous and exciting day for BART and the Bay Area," Board President John McPartland said. "We can't thank our passengers enough for being patient and helping make the day a success." In preparation for the crowds, BART used every train it had available. It also added extra staff members in yellow vests to help with crowd control and to assist passengers. "For the most part people are being patient and courteous, and many people heeded the advice to arrive early and buy tickets a day ahead, which cut down on lines," BART Communications Manager Alicia Trost said. Caltrain also broke a ridership record: The agency said it had 88,000 riders on parade day, which broke the 2010 record of 80,000 - also the day when the Giants came to town for the ticker tape parade. The average Caltrain weekday ridership is 50,000. Wednesday's ridership out of San Jose more than doubled a normal day. Giants fans wrapped around the San Jose train station but 7:30 a.m. waiting to board trains. By 9:30 a.m. Caltrain had dispatched 7 extra trains, 2 that operated as express trains from San Jose to San Francisco and 5 that were dispatched from Redwood City ahead of crowded trains, according to Caltrain. In a statement, Caltrain said it "would like to thank Giants fans and the thousands of commuters who ride Caltrain every day for their patience." Ridership also jumped on Golden Gate Ferry, spokeswoman Mary Currie said. The ferry from Larkspur to San Francisco carried about 6,000 people between 6 a.m. and 11 a.m., while it usually carries about 5,000 for an entire day. San Francisco officials estimate 1,000,000 people flocked to Market Street to see the Giants World Series ticker tape parade.